Ten songs based on the words and spiritualities of the saints. Featuring Therese of Lisieux, Maximillian Kolbe, Augustine, to name a few. Musical styles are as varied as the saints themselves (folk, pop-rock, pseudo-classical). I think that sometimes people think of “the saints” as a kind of conglomerate of boring, holy people. That “the saints” are a bunch of people who spent their lives staring up to heaven and had no real personalities of their own. But nothing could be further than the truth. The saints lived real flesh-and-blood lives, and each had his or her unique personality. This collection of saints is hopefully a good look into the diversity of the saints, and how each saint is quite unique. In this collection, there’s a mother who so loved her child she died for her (Gianna Molla), there’s a once-public sinner who laments his wasted youth (Augustine), there’s a teenager who wants to be a Jesuit more than anything (John Berchmans), there’s a man who laid down his life for a near stranger (Maximillian Kolbe), and there’s a guy who loves a good laugh (Philip Neri). This is not a meditation CD. Some of the songs are more “meditative”, but that's just part of the rather eclectic mix that is this CD. Some of the songs are meant to be played loud in a car stereo (Ignatius of Antioch and John Berchmans in particular, I think). 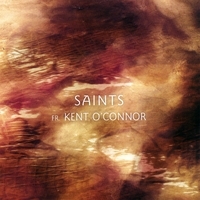 I wanted a collection of saints and songs that were earthy and tangible. I wanted to represent the saints with “some meat on their bones.” So, I wanted to use "earthy" sometimes "gritty" instruments. I'm also a big fan of using "real" instruments. For instance, I don't like using a synth to sound "almost like a cello," I prefer to use a real cello. If you're curious about me, I really am a Catholic priest. I was ordained for the Archdiocese of Kansas City in Kansas in 2003. Currently I am pastor of Sacred Heart in Sabetha, St. Augustine in Fidelity, and St. James in Wetmore, KS. I see music as an extension of my ministry; an opportunity to present the faith in a unique way. I hope that this CD is an enjoyable listen for you. And more than anything, I hope that it inspires you to learn more about the saints, and in so doing, that you may live a saintly life. Very creative. A great way to peek into the lives of a few of the saints, while reminding us that these were some "regular people" just like us who managed to do something extraordinary, whether great or small.